If you ever come to the Southern region of Vietnam, one of those countries in Mekong Delta, don’t miss any chance to visit the floating markets. Cai Rang Floating Market is one of the three biggest wholesale floating markets in the Mekong Delta tours, along with Cai Be and Phung Hiep. 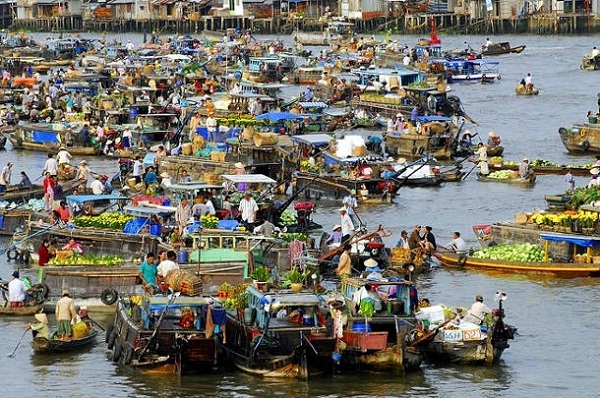 The market is about six kilometers from Can Tho, about a 30-minute boat ride. It is literally floating in the middle of Can Tho River. It stretches half kilometer downstream Can Tho River from Cai Rang Bridge. While floating down the river, you will glimpse hundreds of boats gathering there from dawn till noon. There are large sized boats anchored along the shore, which create lanes that smaller boats weave in and out. There are plenty of merchant vessels carrying various kinds of goods, which create an extraordinary lively scene on the river. Various kinds of boats make the area extraordinary animated. Numerous tropical fruits make the water surface colorful. 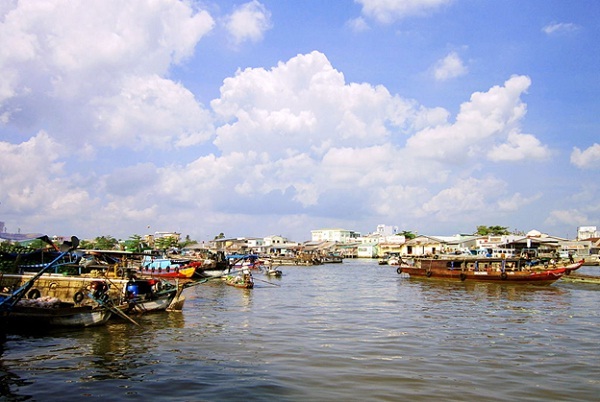 In this bustling floating market, the sellers do not shout out their commodities because their cries would be lost in the vastness of the river and the noise of boat engines. Instead, they tie samples of their goods to a long poll on the deck called “cay beo”, so the buyers can easily see what goods are sold on that boat from a distance. Just look at the hanging samples off the top of the long poles, you will know exactly which boat are selling the product you are seeking for. If you want mango, simply scan the horizon for a hanging mango. 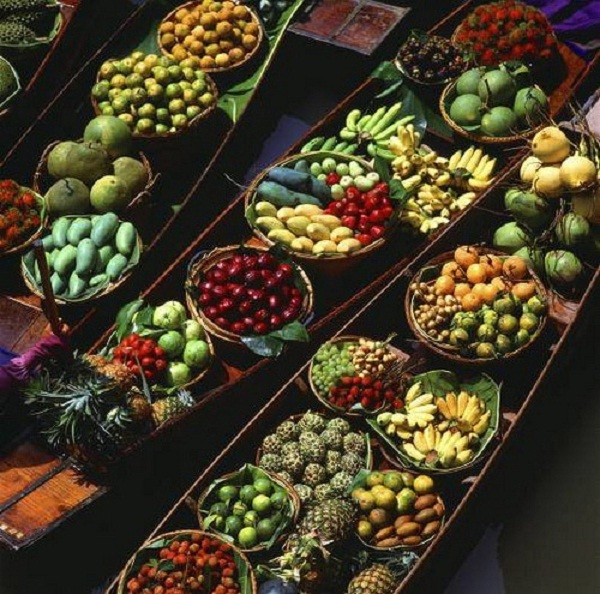 But fruits and other foodstuffs are not the only products that are sold in Cai Rang Floating Market. There are small boats that sell soft drinks, wine and food for breakfast to serve market-goers and visitors. Other services and products like mending machine, gasoline, mobile card, clothes, cosmetic, spices are also available, not different from the common markets on land. Trading from boats brings excitement to buyers when catching some goods thrown from other boats. The boats were not only shops, but houses built on stilts over the water. Most of the sellers have lived in their floating mobile home for over 10 years and never want to leave. The river has become a part of their life. Although the market is open all day, to catch the liveliest scenery of Cai Rang market, the best time to visit is in the early morning when all the boats gather. 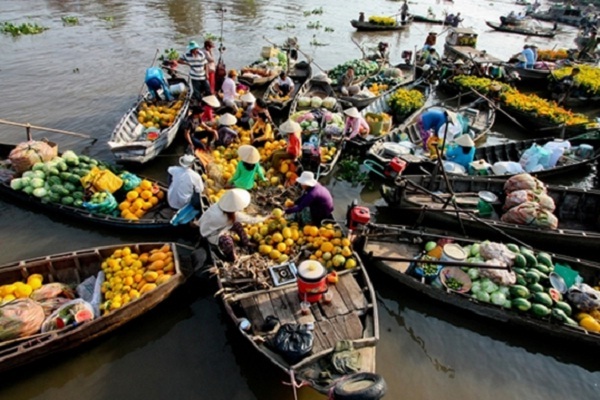 You have to get on a boat in order to appreciate this floating market. You can rent a boat from the “boat ladies” at the Ninh Kiều pier or from local tour agents. Make sure your boat is small enough to take you through the lanes created by the large boats. Cai Rang Floating Market epitomizes how important the waters of the Mekong Delta are to the local way of life. The waters there have always been known as the life and soul of Can Tho, which takes the breath away from some of the global visitors. Mekong Delta has many things to discover. Only by visiting all of Mekong countries does tourist can enjoy its beauty as a whole. What are you waiting for? Let’s pack your clothes and start your trip right away.